Please note that an addendum was issued in September 2018 for this publication, it is available for download and present in both the sample pages and the full PDF. 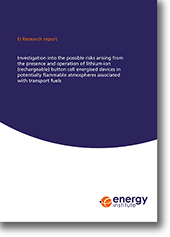 This report was undertaken to assess the possible ignition risks posed by rechargeable lithium-ion button cell energised devices in potentially explosive atmospheres associated with transport fuels. The information provided in this publication is intended to be of use to operators of petroleum distribution installations in their assessments of button cell energised devices. It may also be of use to operators of petroleum road tankers and those responsible for designing, constructing, commissioning, operating and maintaining aviation fuel handling systems. The potential hazards arising from the presence and operation of devices energised by a single primary non-rechargeable button cell were previously investigated and reported upon in EI Research Report: Investigation of the possible risks arising from the presence and operation of button cell energised devices in potentially flammable atmospheres associated with transport fuels, 2014.